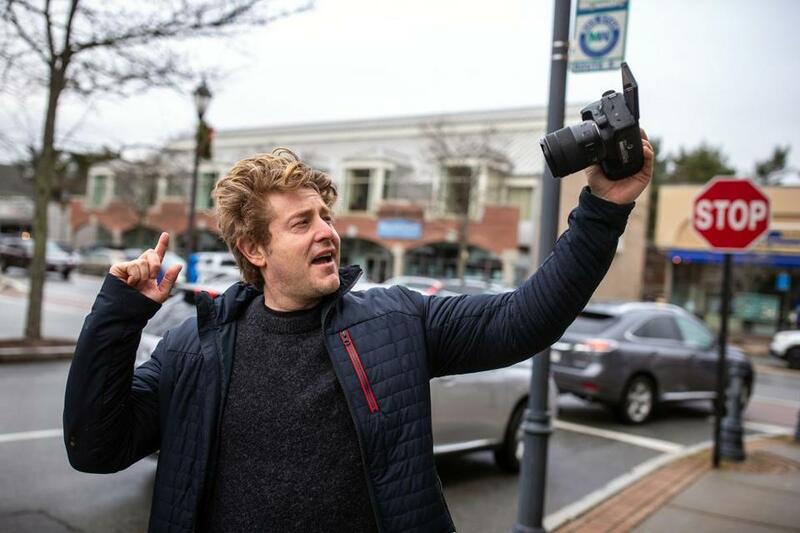 Jason Nash vlogged his day recently in Wellesley. “I know it’s strange, but this is who I am and this is what’s paying the bills,” he said. The majority of Nash’s income comes from AdSense, a Google program that allows YouTubers to make money by placing advertisements in their videos. Companies that advertise with him include Honda, Booking.com, and Stitch Fix, an online personal styling service. He also gets paid for tours with The Vlog Squad, a weekly podcast, merchandise, and brand deals. 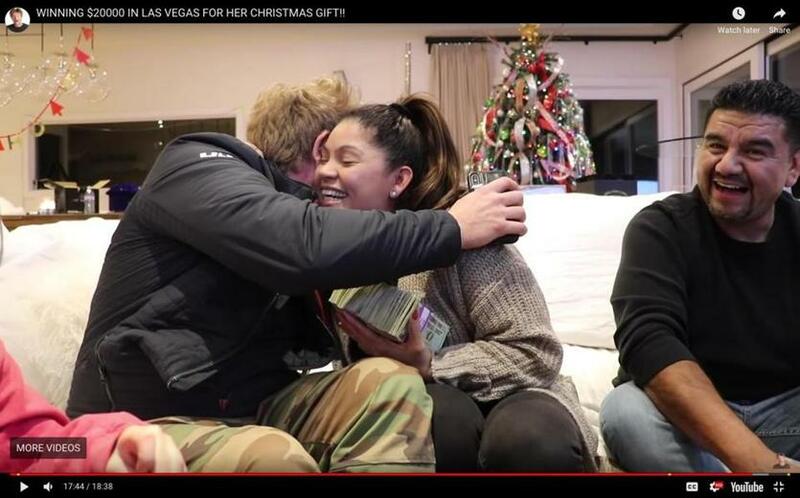 hugged his children’s nanny (below) after giving her $20,000 he won in Las Vegas. According to CelebrityNetWorth.com, Nash’s net worth is $1 million, a figure he disputes. “Those things on the Internet that tell your net worth are wrong for pretty much everyone,” he said. “When I started YouTube, I was pretty broke and it said $1 million then.” Nash said he makes between $1,000 and $3,000 per video, but he wouldn’t disclose his annual income. In Wellesley Square on a recent morning, he propped his Canon on an upside down plastic cup and started recording. Most of the time — when Nash isn’t visiting his family in Massachusetts as he was last month — he films up to 12 hours a day with his friends to create three 15- to-20-minute videos per week that are posted on his YouTube channel. He also contributes ideas and bits to videos for other Vlog Squad members’ channels. In December, Nash earned 17 million views for his click-worthy videos, including one in which he surprised his children with a trip to meet social media and Nickelodeon star JoJo Siwa, and another in which he handcuffed himself to his girlfriend for a day. But the craziest thing he’s done for his vlog was gamble $10,000 — double or nothing — in a game of roulette last month, he said. Nash initially wanted to gift his nanny $5,000 for Christmas, but David Dobrik, the brains behind The Vlog Squad, suggested trying to increase the number to $10,000 by flying to Las Vegas. “I need a vlog for today, and when David needs a vlog for today, good things happen,” Dobrik said in Nash’s video. Nash reluctantly agreed. Dobrik, 22, said he challenges Nash to take more chances because that is what appeals to their audience, and keeps them coming back. That, in turn, keeps the ad revenue flowing. 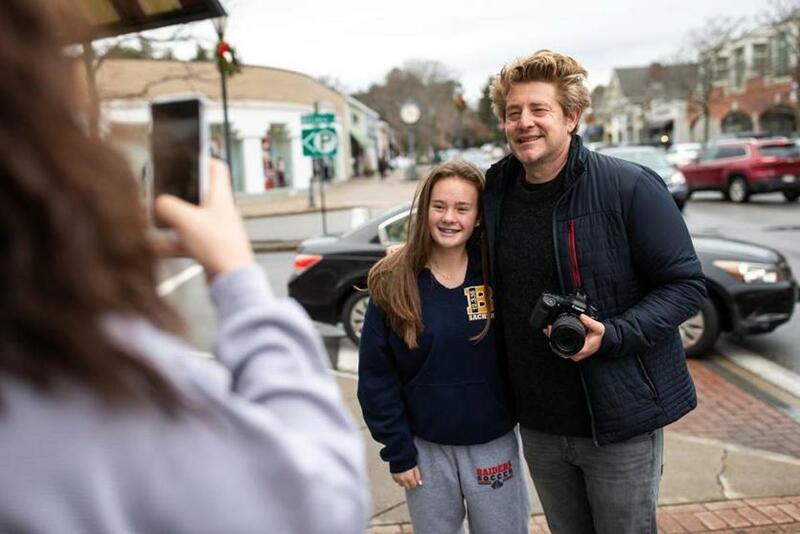 Fan Lucy Mitchell, 15, greeted Jason Nash as he was vlogging his day in Wellesley recently. Before Nash and Dobrik began filming YouTube videos together in December 2016, they got to know each other as they both gained popularity on Vine, the now-defunct app where users could create six-second looping video clips. Nash had also written, directed, and acted in a movie called “FML,” about meeting a friend on Vine and road-tripping around the country to make videos. On the same day that the film was released in October 2016, Nash received a text from his co-star that Vine was going to be shut down. The movie tanked. Dobrik helped Nash find more viewers by inviting Nash to appear in his vlog a couple months later. “I was doing standup and David came into the comedy club and he saw me do some routine about millennials and he was like, ‘Do you want to come do this in my vlog tomorrow?’” Nash said. It was the beginning of a mutually beneficial content-creating partnership. Nash said he owes his success on YouTube to the work he’s done with Dobrik. Another actor who joined The Vlog Squad is “Drake & Josh” star Josh Peck. One day when Nash and Dobrik were brainstorming vlog ideas, Dobrik said he wanted to meet Peck. Nash knew Peck because he appeared in an episode of the Nickelodeon TV series in its heyday, so he asked Peck if he wanted to do some improv on camera. Peck said the immediacy of YouTube allows creators to be in control of every aspect of their content. Dobrik said he feels lucky to be able to work with Nash. Nash’s experiences as a divorced father of two kids also make his role in “The Vlog Squad” unique, Dobrik said. For Nash, supporting his children Wyatt, 13, and Charley, 10, always comes first, he said. And while he is hopeful that YouTube will continue to grow, he knows the landscape can quickly shift on social media.